MSC Cruises has confirmed the options it had with STX France, ordering a further two enhanced ships based on the Meraviglia class. The new ships will form the Meraviglia-Plus class and will boast increased tonnage and overall size compared to the original Meraviglia class. The 331 metre-long, 177,100 gross ton, next-generation ships will feature 2,444 cabins – 200 more than MSC Meraviglia – and will have a maximum passenger capacity of 6,300 guests, just 300 passengers fewer than Costa Cruises’ new LNG-powered cruise ships. The expanded public spaces will be filled with boutiques, restaurants and tranquil spots for shopping, eating and relaxing as well as socialising. The interior promenade will now span 111 metres in length and will be crowned with a 95-by-6 metre LED sky screen beaming out visual events and vistas round the clock to animate the entire promenade from above, creating a unique atmospheric experience. The Cirque du Soleil partnership will be rolled out onto the Meraviglia-Plus class ships, which will also be the first to feature classic and contemporary fine art museums at sea. Guests can experience masterpieces from around the globe in collaboration with the world’s premier cultural centres, classic and modern art museums as well as public and private institutions. The two new ships will be due for delivery in October 2019 and September 2020. 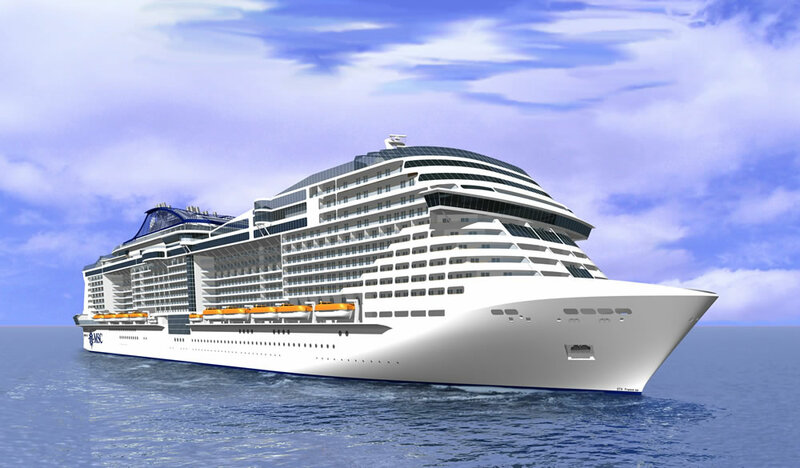 MSC Meraviglia is due to be delivered in May 2017 with a second yet-unnamed vessel due for delivery in early 2019. The recently announced partnership with Samsung will see next-generation technology installed on all four ships, including the latest displays, mobile solutions, medical equipment and even products for enhanced reality experiences. The announcement was made as the coin ceremony for MSC Meraviglia took place at the STX France shipyard in Saint-Nazaire, France yesterday. At the coin ceremony it was also announced that MSC Meraviglia will be christened on 1 June 2017 in the UNESCO-listed port of Le Havre, France. From there it will sail to its home port of Marseille. Inaugural Western Mediterranean itineraries on MSC Meraviglia went on sale in June last year.